How to write a Consumer Loan Agreement? An easy way to start is to download this Consumer Loan Agreement template now! When a bank or a financing company issues loan to an individual for personal purposes i.e. shopping most of the time, they call it a consumer loan. This loan can be secured or unsecured but most of the time, the consumer loan is unsecured. The bank or the financing company just evaluates the worth of the debtor. And analyzes his credit habits to see if he qualifies for the loan or not. This means that most of the consumer loans don’t include or require collateral or guaranty of personal property or possessions. When a bank gives loan to a consumer, they both enter in a contract known as consumer loan agreement. If this loan becomes past due, the Lender will have the right to pay this loan from any deposit or security Borrower has with this lender without notice to him/her. If the Lender gives Borrower an extension of time to pay this loan, he/she still must repay the entire loan. Now we provide this standardized Consumer Loan Agreement template with text and formatting to help you finish your document faster. If time or quality is of the essence, this ready-made template can help you to save time and to focus on what really matters! Don't try to reinvent the wheel every time you start to work on something new! 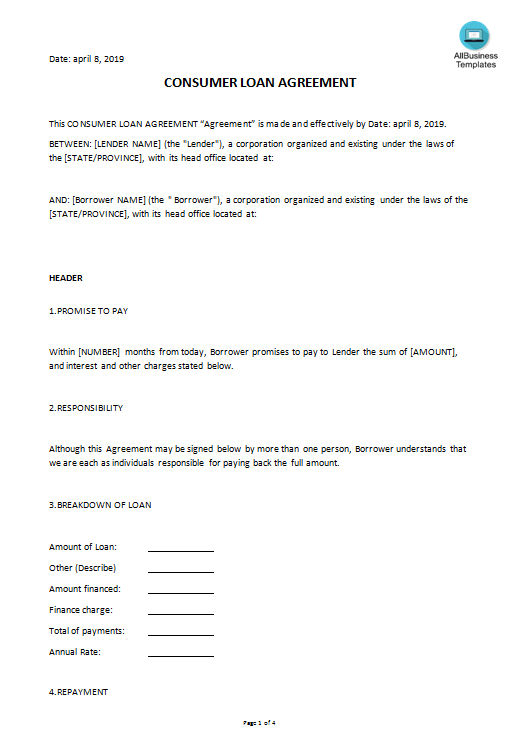 Download this Consumer Loan Agreement template now for your own benefit now!